Food Industry Pitted Against Public Health At U.N. Summit : Shots - Health News At the first United Nations General Assembly session on chronic diseases this week, public health advocates questioned whether food companies should be treated as partners when making policy on chronic disease. 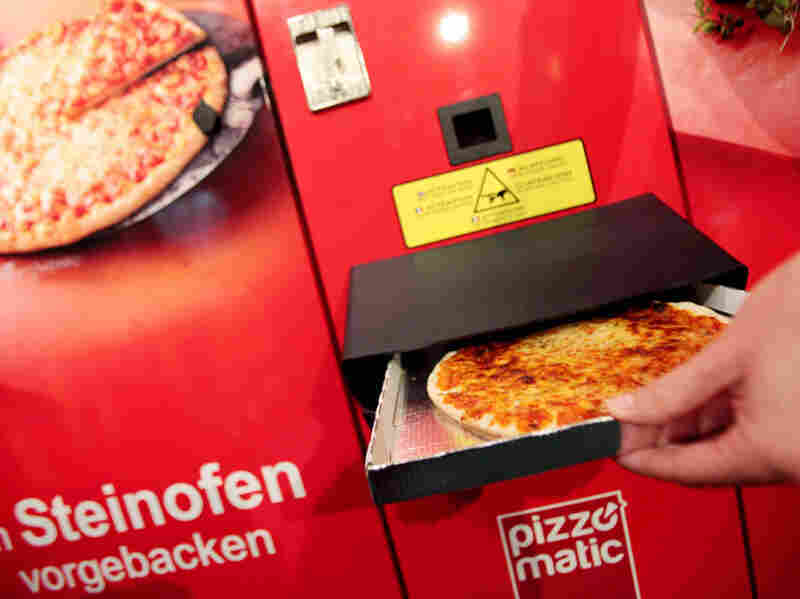 A pizza from a Pizzomatic vending machine that bakes and sells pizzas in Germany. Public health advocates say the food industry needs to make concrete commitments to making healthier products to reduce chronic disease related to diet. How do you come up with a plan to help millions of people around the world avoid a chronic disease? For starters, don't treat the food companies that sell the products that contribute to those diseases as partners in the process. At least, that's what public health advocates argue — even as the accused companies say they're committed to making healthier products for the masses. This is all part of the conundrum of taking action at the first United Nations General Assembly session on non-communicable diseases, which concluded today in New York. "Some food products and companies are clearly in conflict with the goals of the summit," Shiriki Kumanyika, a professor of epidemiology at the University of Pennsylvania School of Medicine who represented the International Association for the Study of Obesity there, tells Shots. "So the question is: how do you partner with people who are part of your problem?" Non-communicable, or chronic, diseases kill more than 36 million people a year, according to the World Health Organization. The four biggest ones are cardiovascular disease, cancer, lung disease and diabetes. Unlike most infectious diseases, these diseases tend to involve some amount of personal choice – around nutrition, consumption of alcohol or tobacco, and physical activity. They're also very costly. Some have estimated that $84 billion in economic output will be lost between 2005 and 2015 as a result of non-communicable diseases. So the hope is that the heads of state in attendance at the summit will come up with a concrete commitment to reduce disease — for example, a 25 percent reduction in preventable deaths by 2025. Because if nothing is done, deaths from chronic disease could rise to 52 million a year in 20 years, the WHO says. But some say bringing chronic disease rates down also requires industry to agree to make some real changes, too — for example, lowering sugar and sodium content in popular food items. And some experts are skeptical that will happen voluntarily. "Ideally, what would come from this summit is some tough criteria about nutrition, food marketing and food processing that the companies would be expected to meet if they want to avoid government regulation," Kelly Brownell, director of the Rudd Center for Food Policy & Obesity at Yale University, tells Shots. "But my guess is that you're not likely to see that, because the food companies are too involved with the event." The main problem, according to Kumanyika, is that the U.N. doesn't recognize the potential conflicts of interest in having food companies help set health policy. In a paper published online in The Lancet, several public health groups cited the influence of BINGOs (business-interest not-for-profit NGOs), which are set up by, represent, or closely linked to business interests. They asked that the WHO come up with a code of conduct to manage potential conflicts of interest. But it seems that in the documents drafted by U.N. parties in advance of the summit, industry may have already had its say. The British Medical Journal obtained a copy of the draft a few weeks ago; it reported that "a specific target of reducing population salt intake to less than 5 [grams] per person per day has been considered but deleted." Even so, several food and beverage companies, including PepsiCo, have voluntarily begun to reduce the sugar and sodium content and expand "healthy product" lines. PepsiCo last year also announced it would stop sales of its full-calorie soft drinks to primary and secondary schools around the world by 2012. And last month, McDonald's overhauled its Happy Meal in response to complaints that it wasn't nutritious enough.